Due to custom uniform ordering requirements, there is no late registration for Cheerleading. SCVAA High School (9th. - 12th.) Grade Cheerleading. 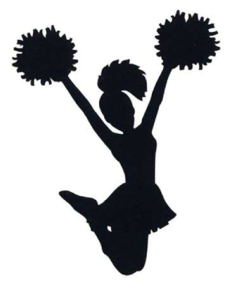 The SCVAA will again be providing the SAHS Cheerleading Program. Look for upcoming information and dates on parent meetings. Practice Days: Monday and Wednesday thru Labor Day. One TBD day per week after that. Game Schedules will be determined and posted after Football Schedules are completed. As cheer coaches, we will strive to instill tradition,honor, commitment and pride in our teams and in each other. We will build a solid foundation based on trust and loyalty. We will work to be organized,consistent and supportive to make this an exemplary cheer program and a positive experience for all. The following will be the basic skills taught in the SCVAA Cheerleading Club. For more information on the SCVAA Cheerleading Club, contact the current Club Coordinators listed on the Cheerleading Club Contact Page.